Nothing beats an Arizona Sunset. Tombstone Arizona, Allen Street in the 1990's. Heading into the Narrows Canyon and soon travelling in between Charleston to the right and Millville to the left. John Rose on the San Pedro Train. Very small railroad cars that have their own motors. This was a club that vacationed traveling available railroad track across the US. In this image they were about to use our track heading south from Benson toward the Charleston area. Inside the locomotive, with "Bobcat," and a near legend in area railroading, my friend, Jim McNeil. It amazes me how hearty plants in Arizona can grow under the most challenging of conditions. Anything that can survive in the Arizona desert on its own has to be special in terms of its survival abilities. There's nothing like an Arizona sky, as this photo shows. Another Arizona Sunset, with the Huachuca Mountains in silhouette. Although this appears like a fire in the distance, its a spectacular Arizona Sunset. The Boston Mill, north of Charleston and Millville. John Rose and Bill Hoy at the Fort Bowie National Park. Bill is the past manager of Bowie, and an expert on the history of the area. John Rose in the general area of where Geronimo and Naiche stood in the memorable photo taken by Frank Randall just before their deportation from Arizona. Historic Brunckow Cabin, the scene of many violent encounters, and one of the oldest sites in Cochise County. Brunckow Hill, named in honor of Frederick Brunckow, who was murdered, along with John Moss and James Williams, by his crew. The approach to Brunckow's cabin, which is visible in the middle of the photo in the distance, has been fenced off by the BLM, making access difficult. Cattle having a bit of grass near Brunckow Cabin. The exact location of Richard Gird's Charleston dam, as featured on page 25-25 of "Charleston and Millville A.T., Hell on the San Pedro," by John D. Rose. View high in the Dragoon Mountains from the area commonly referred to as "China Camp." The water source at the site in the Dragoon's known as "China Camp." A view of the Chiricahua National Monument, a must see for any visit to Arizona. Christmas 1995 as I narrate on the San Pedro and Southwestern RR, dressed as an elf. John Rose at the site locally believed to be the Clanton Ranch. Working the switch near Charleston on the San Pedro and Southwestern railroad. The San Pedro River flows through a portion of Contention City. Ruins are barely visible in this photo of Contention City. The small hill in the background shows the location once carved out for the Contention Mill, which processed some of Tombstone's richest ore, from the Contention Mine. Another view of the San Pedro River near Contention City. And still another view of the San Pedro River near Contention City. A hiker at the ruins at Contention City. The wood supports standing upright once held up a bridge for the New Mexico and Arizona Railroad, which was used by Wyatt Earp to ship the remains of Morgan Earp to California for burial. A closer view of the same photo, with the pass in the Whetstone Mountains where Wyatt Earp killed Curly Bill, in the far distance. John Rose at Council Rocks, in the Dragoon Mountains, outside of Tombstone Arizona. A rugged landscape near St. David Arizona, known as Curtis Flats. A concrete dam is visible in the San Pedro River. Note how the river made the dam useless by eroding far around it. Decoupling near Millville on the San Pedro railroad. John Rose at the last remaining wall at Drew's Station. Grave of John Dunbar, former partner of Johnny Behan, himself a key player in the early Tombstone story. I often joke with friends that as a collector, I spent my first million (exaggeration of course but sometimes it seems close) on ebay. While viewing grave markers of historic Tombstone notables, I came across this one, for George E.Bay, proving that e.bay died in 1954, well before its first appearance on the web. Ruins near the San Pedro River, closer yet to Escapule wash. Local legend has it that this was once the Moson Family home, though solid proof of this has yet to be established. The related and uncorroborated story goes that a house guest visiting during a hot summer left the window open when going to sleep, and a breeze blew the drapes close enough to an oil lamp in ignite, and the home was lost in a fire. More of the same substantial home site now in ruins. What may be a form of a storage silo for grain, feed, or other ranching supply, near the ruins pictured above. Its built into a side of a hill and his larger in person than it appears in this photo. Fairbank still endures, in this photo taken in 1996. The Grand Central Mill in the distance in this photo taken from the San Pedro railroad. Helldorado Parade in Tombstone Arizona. Dressed as a Cowboy with rope in hand, if you look closely you'll see the rider is on top of metal replica of T-Rex. An old engine display on Third Street in Tombstone. 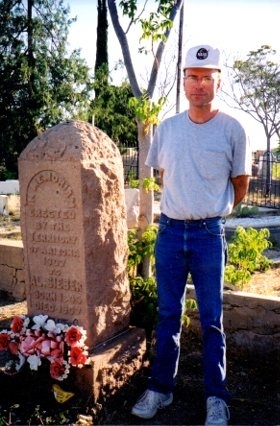 My friend from the former East Germany enjoying his new found freedom and fulfilling a life long dream of visiting Tombstone. 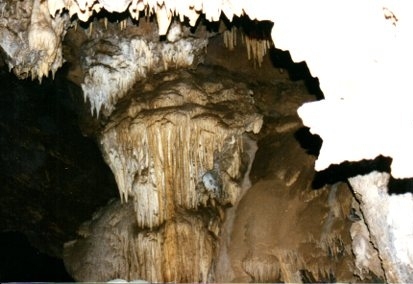 A unique underground location to visit on the western side of the Huachuca Mountains, in Ida Canyon, known locally as Cave Canyon. We repelled into a mine which tunneled into an underground cave, still with mining equipment in it, with a large pond at the bottom. Copyright John D. Rose, 2014-2018, all rights reserved.